The house is located in County Tipperary in the Midlands, on the banks of the majestic river Shannon. It can be easily reached from either Shannon airport (1 hour), Kerry airport (2 hours), Dublin airport or ferry port (2 -2.5 hours) or Cork (2.5 hours). The central location makes it an ideal base for exploring the local points of interest or daytrips to the West coast. The N7 Motorway is within 25 km of the house (Nenagh exit). The West Coast of Ireland is only c. 1 hour drive from the house (Galway). From the car rental pick-up, go to Way Out in direction of M50 Motorway. Always head for M50 Southbound . There is a toll to be paid (check with your rental car provider whether this is included in rental price, otherwise it has to be paid by phone, internet or in designated shops until 8pm the following day). Follow M50 south, then leave it for N7 Direction Limerick at junction No. 9. Stay on N7 for c. 60km, you will have to pay another toll (cash). Stay on N7/M7 Motorway until Exit No. 26 (Nenagh). Follow the signs for N52 Direction Borrisokane/Birr, you will go through several roundabouts. After the last roundabout, stay on N52 until you come to Borrisokane. Go through the village until you come to a crossroads, take the road to the left direction Ballinderry. Once you arrive in Ballinderry, take a left on the crossing (disused gas station with lots of parked cars on left). Go past Elsie Hogan's pub and then over a stone bridge. Immediately after the bridge take a right and stay on main road. After 4 kilometres you should see a sign "Kilgarvan Quay" on the right side of the road. 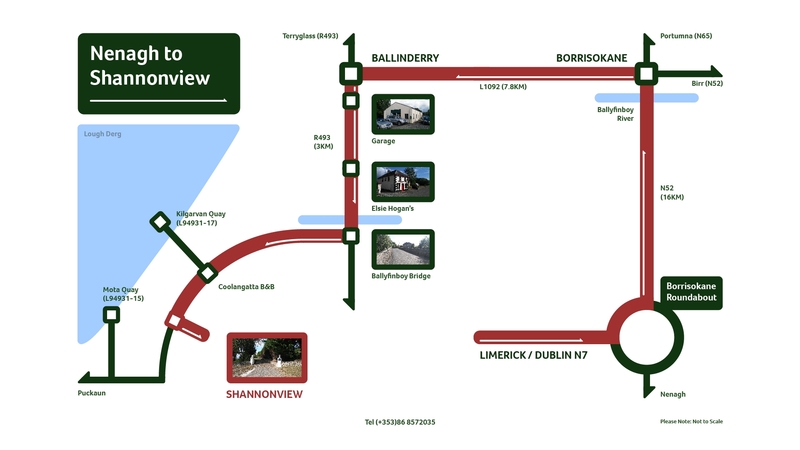 Stay on the main road, Shannonview Selfcatering is the next house on the left hand side on the hill (next house after the Bed & Breakfast). Go slow as you have to take a wide swing into the driveway up on the left. There are two stonepillars with lions on them. We would be happy to send directions from other Irish airports or ferry ports if needed.